A resource book of grammar games and interactive activities. 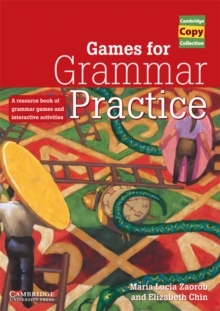 Games for Grammar Practice is a teacher's resource book containing a selection of more than forty games and activities for grammar practice. The activities are designed to promote intensive and interactive practice with learners of all ages from elementary to advanced level. Photocopiable pages and step-by-step instructions provide instant supplementary activities for busy teachers. The emphasis on peer interaction and cooperation helps students find grammar practice meaningful and rewarding. The grammar areas covered in the book are all commonly found in courses, making the activities easy to slot into a lesson.